Kunzman tells the story “If You Give A Mouse A Cookie,” by Laura Joffe Numeroff, to a group of second graders. Nearly 20 years ago, Marion Kunzman of Albion, said goodbye to teaching—however, retirement hasn’t stopped her from applying her passion in other ways. 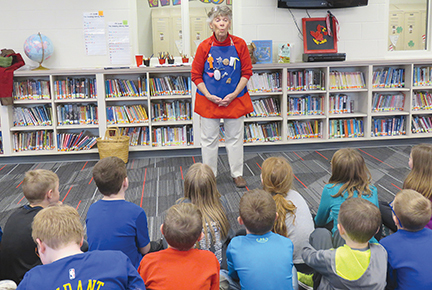 Last week, Kunzman spent her afternoons telling stories to elementary students at Boone Central, where she taught for 32 years. Kunzman doesn’t use a book when she narrates, rather she recounts the stories completely by memory. She also wears an apron, upon which she sticks Velcro characters that are part of her story. “Even if I stood up there without the visuals, they really just want to hear the stories,” Kunzman said. Kunzman, who taught for a total of 39 years, said storytelling is a precious past time of hers. Some of the stories Kunzman tells include, “It Looked Like Spilt Milk” by Charles G. Shaw and “If You Give A Mouse A Cookie” by Laura Joffe Numeroff. “I don’t know if people usually tell children stories in this way, so whenever I do, they just eat it up,” Kunzman said. By telling stories in this way, Kunzman said it gets children interested in reading the books themselves. After graduating high school, Kunzman received a rural teaching certificate from Wayne State College and first began teaching in 1951 at District 7 country school. Soon after, she married her husband, Jack. In June, they’ll celebrate 64 years of marriage. Together they have five children: Alan (Kathy) Kunzman, Annette (Doug) Kunzman-Solomon, Michelle (Steve) Kunzman-Szafman, Kevin (Licia) Kunzman, and Kay (Joe) Flanagan. Although Kunzman had no intention of teaching again after having children, she returned to the field in 1963.